Rockstar's interactive L.A. Noire crime map details the real crimes of 1947 Los Angeles, some more outlandish than others. One of the key components of Rockstar Games' upcoming L.A. Noire is its serious tone. The game isn't devoid of humor, but intentionally won't be Grand Theft Auto in the shoes of a police officer. 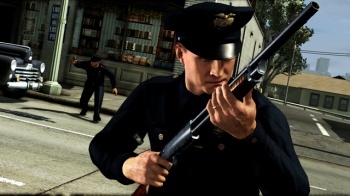 L.A. Noire's focus on serious crimes is exemplified by Rockstar's creation of a 1947 crime map, which gives players an idea of the actual crimes that were committed in that year, and of those that they'll be attempting to solve. The map shows the entirety of Los Angeles and the approximate locations that certain crimes were committed. They're divided up on the map with icons by type, such as homicide, robbery, etc. Clicking on an icon brings you to an actual newspaper clipping written about the crime in 1947. For example, on January 20, a 20-year-old Navy veteran and his wife returned from a night of celebrating when he mysteriously attacked her with a shotgun, and then turned it on himself. It's implied that his time in the war affected him and may have led to the incident. Another crime isn't quite as heavy, detailing an affluent opera singer that neglected to report a stolen vehicle. The map also shows that humor in L.A. Noire will come from the crimes themselves, not necessarily from coke-snorting nutcases that quip one-liners as in Grand Theft Auto. The crime map details a September crime where two bodybuilders traveled to a location to determine who was the alpha, and one hit the other over the head with a weight and stole his car. Another focuses on acrobatic thieves that came in through a market's skylight, drank a bunch of milk, and made their way off with choice cuts of meat. As seen in its various trailers and L.A. Noire's PAX East demo, players will get right into the nitty gritty of these types of cases. The exact crimes featured on the map don't appear in L.A. Noire, but I would assume they've inspired a situation or two in the game. Rockstar will be adding more crimes and more newspaper clippings to the map in the future. You can check it out here. L.A. Noire will be available on May 17 for the Xbox 360 and PlayStation 3.